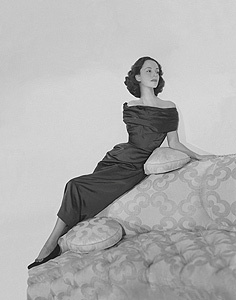 Truman's Swans—Babe Paley, Gloria Guinness, Slim Keith, Pamela Churchill, Marella Agnelli and C.Z. Guest—were the original "ladies who lunch." These women would gather at their favorite tables—generally in the front of the restaurant—and be fawned over by the owners and the waiters. It was all about being seen, and being seen with the right people. And wearing the right clothes, of course, complete with gloves and hats! After lunch, there would be paparazzi waiting outside to snap their pictures for such magazines and newspapers as Women's Wear Daily, Vanity Fair, The New York Daily News and The New York Post. And of course, one of these restaurants, La Côte Basque, was the setting for Truman's infamous short story "La Côte Basque 1965." La Côte Basque is no longer around; neither is The Colony or Le Pavillon, among the Swans' favorite haunts. But fortunately, both 21 Club and La Grenouille are; they both evoke the world of the Swans, with elaborate table flowers and old-world charm and service. Hats and gloves are optional, but would not be out of place in either. The ladies who lunched were also the ladies who shopped! Naturally they frequented places like Saks Fifth Avenue and Henri Bendel when they had to, but the mecca of meccas was Bergdorf Goodman. Bergdorf's was founded in 1901 by Edwin Goodman, who first worked as an apprentice in the original tailor shop owned by Herman Bergdorf. The store had several locations before moving to the current spot at Fifth Avenue and 58th in 1928. This is the iconic Bergdorf's, located across from the equally iconic Plaza Hotel, overlooking Central Park. The Swans were fawned over every time they entered the store; they had personal assistants to help, and of course, personal charge accounts, as well. Bergdorf's is where a young millinery designer named Halston got his start, before moving on to design his own fashions. 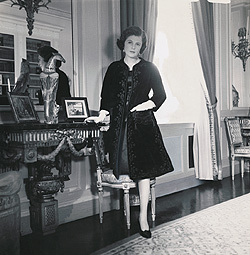 If you couldn't zip over to Paris on your private plane for a fitting at Christian Dior, you could order the newest fashions through Bergdorf's, which was the first store in New York to carry true designer collections. Barbra Streisand filmed part of her legendary television special, My Name is Barbra, at Bergdorf's. It remains the place to shop today, and celebrities regularly stop by, or sneak in after hours for a little private shopping spree. Naturally, one must stop at Tiffany's when in Manhattan. After you elbow your way past the tourists who are all posing in front of the window, a la Holly Golightly, you will be ushered by a top-hatted doorman into a timeless world of elegance. 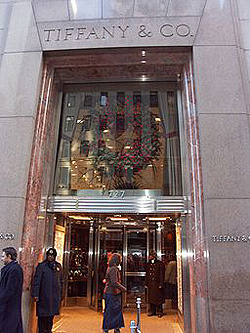 Tiffany's was founded by Charles Lewis Tiffany and John B. Young in 1837, and was originally a stationery and fancy goods emporium. It was called "Tiffany, Young and Ellis." It became "Tiffany and Co." in 1853, when the store decided to concentrate on selling jewelry. 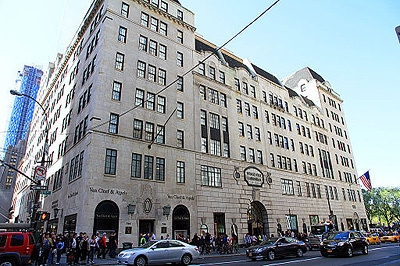 In 1940, Tiffany's opened the store at Fifth Avenue and 57th St.—the famous store where Audrey Hepburn ate a pastry in the opening credits of the film version of Truman Capote's novella, "Breakfast at Tiffany's." Inside, you might encounter tourists simply gawking, socialites buying necklaces, or young brides registering for place settings. 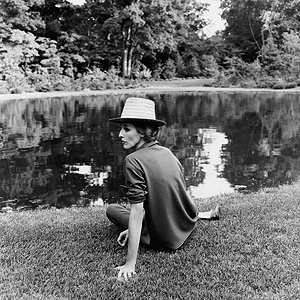 Babe Paley bought small gold-plated notebooks, in which she would make note of how a dinner party was going, so that in the future she might not repeat any mistakes, at Tiffany's. I bought a Tiffany blue pen to sign copies of The Swans of Fifth Avenue there; the only thing I could safely afford! Of course, if you want to avoid the tourists, you can always buy your jewels at another emporium favorited by the Swans, Van Cleef & Arpels. Or Cartier. Or Bulgari. All on Fifth Avenue. The Plaza—the personal playground of Truman and his Swans! This is where Truman held his famous 1966 Black and White Ball, to celebrate the success of In Cold Blood. The Plaza opened at 768 Fifth Avenue in 1907. 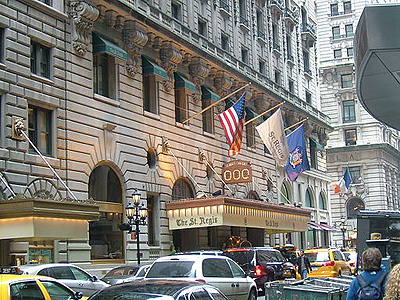 Its situation directly across from Central Park has always led to its caché, and the hotel has long been a favorite of the rich and famous. The Pulitzer Fountain, in the adjacent Grand Army Plaza, is where F. Scott Fitzgerald and Zelda famously took a swim; the hotel itself has been featured in countless movies, including Home Alone 2 and The Way We Were. The Plaza has gone through many different ownerships, including Donald Trump in the 1980s and 1990s. Truman Capote chose the Plaza's grand ballroom for his ball because it was the most elegant place in Manhattan. He was very fond of the chicken hash that is still a house specialty, and so had it served at midnight during the ball. He could also be spotted at the famous Oak Bar, drinking with other literary figures of the day like Norman Mailer and Gore Vidal. The Plaza today is a combination of new and old. You can still have tea in the famous Palm Court (where Babe and her sisters have tea in The Swans of Fifth Avenue), sip champagne in the Champagne Bar or Rose Club, or even have a drink in the Oak Bar (which is really a separate establishment, although located adjacent to the Plaza). But there is now a food court in the basement (I can't imagine what the Swans would think of that), and the hotel hosts Eloise birthday parties to celebrate the Plaza's most famous (fictional) resident. The St. Regis hotel, located at 55th and Fifth Avenue, is where Babe and Bill Paley had a pied-a-terre, lavishly decorated by Billy Baldwin and Sister Parish. It was fashionable then to have a small apartment in the city during the week, and then spend your weekends at your gorgeous country estate (in the Paley's case, Kiluna Farm on Long Island). Due to the small footprint of this apartment, the Paleys mainly entertained at Kiluna, or at restaurants. Many celebrities had apartments at the St. Regis, including Salvador Dali and Marlene Dietrich. 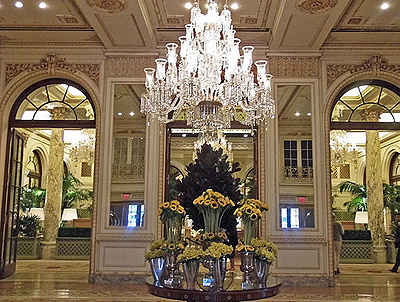 The St. Regis was built in 1904 by John Jacob Astor, who later died on the Titanic. It has always been a luxury hotel favored by royalty and celebrities. In 1932, Maxfield Parrish painted the famous "Old King Cole" mural that gave the new bar its name; in 1934, a bartender there created a drink we now know as "The Bloody Mary." Today, you can still have a Bloody Mary and gaze at the famous mural in the Old King Cole bar, or have tea, like I did while researching The Swans, in the lovely Astor Court. 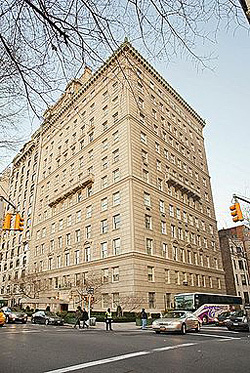 Babe and Bill Paley eventually moved to a larger apartment in the city, occupying the 9th floor of 820 Fifth Avenue, overlooking Central Park east. This is where the grand mansions of the Gilded Age were built; this neighborhood was home to Vanderbilts, Whitneys and Astors. It is still one of the most fashionable in New York, and it's fun to explore. Apart from Central Park itself (the Boathouse is one of my favorite places to have a drink and people watch), you have the Metropolitan Museum of Art, the Guggenheim, the Whitney, and the Frick, among other museums. Laduree, the famous Parisian bakery, has a store on 864 Madison Ave, so stop in and treat yourself to one of its famous macarons. Madison Ave., in this neighborhood, is home to many high-end designer stores such as Chanel, Celine, Chloe, Michael Kors, Dolce & Gabbana, and many more. If you really want to live like a Swan, you can vacation in a luxurious villa at Round Hill Hotel and Villas, Jamaica. Round Hill is where the Paleys had a famous private villa, along with other luminaries such as Noel Coward and Oscar Hammerstein II. It is now a luxury resort. 860 United Nations Plaza is where Truman bought an apartment, moving into Manhattan from Brooklyn, when he was flush with the royalties from In Cold Blood. At the time it was a modern architectural marvel, and a highly-coveted address. Johnny Carson and Bobby Kennedy both had apartments there, as well. The CBS building, known as "Black Rock" because of the granite used in its construction, is at Sixth Avenue and 52nd St. Bill Paley oversaw the design and construction of this building that opened in 1965. It is still the headquarters of CBS Corporation.